Getting humans to Mars could cost upwards of $1 trillion. But for the astronauts making the journey, the cost could be even higher — they might pay with their lives. 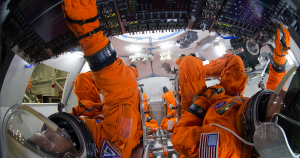 According to a new NASA-funded study conducted by researchers at Georgetown University Medical Center, exposure to galactic cosmic radiation during a trip to Mars could leave astronauts with permanent and potentially deadly damage to their gastrointestinal tissue. On Earth and in its orbit, people and animals are protected from certain types of cosmic radiation by the planet’s magnetic field. For their study, published Monday in the Proceedings of the National Academy of Sciences, the researchers attempted to simulate the conditions found in deep space by blasting 10 male mice with doses of heavy ion radiation — the equivalent, they said, of what a human astronaut would be exposed to on a deep space journey that lasted several months. The researchers then euthanized the mice and studied samples of their intestinal tissue. They found that the guts of irradiated mice hadn’t been absorbing nutrients properly, and had formed cancerous polyps. Even worse, the damage appears to be permanent — mice killed and dissected after a year still hadn’t recovered. The findings are alarming because we don’t yet have a way to protect astronauts from cosmic radiation. Of course, mice aren’t the same as humans, so the actual effect of radiation on astronauts is still largely unknown. However, if we ever hope to send humans to Mars and beyond, nailing down the effects of deep space on astronaut health will need to be a top priority.